My name is Fabio, I am a stage hypnotist, performing under the stage name of The Amazing Fabtronic. Have you ever wondered how to hypnotise people, to feel the power of hypnosis. Have you ever fancied earning a substantial income part-time, from something that is great fun? The entertainment industry. 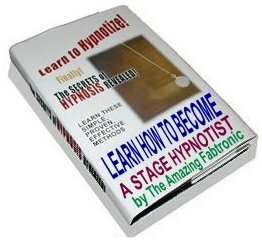 My course teaches you everything you need to know to start your very own stage hypnotism show. As far as I am aware, this is the only place where you can find out this information from a live performing stage hypnotist. All the secrets revealed just for you, with me there to guide you. With my course you will learn all about stage hypnosis, and how it differs from medical hypnosis. You will also learn how to promote yourself effectively in order to introduce the idea of hypnotism to the audience. You will learn to quickly tell who can, and who can't be hypnotized, so that you can pick the cream of the volunteers for your act. Before you know it, you will be able to induce people into a trance at will, just by saying a word, and get them to perform entertaining acts on stage. You can also use the skills you learn on this course at parties, or at friend's houses for fun. You will also learn how to finish your act correctly. There simply is no other course to match this one on or off the net. The complete course comes in an eBook which will run on any PC with windows on it. All this information is available to you for just £4.95, by just clicking the PayPal button below!